The second in a trilogy of magic-fantasy-adventure. In The Cloak of Golden Symbols, Anna returns to her grandfather's home and studio for another summer. She is excited to spend her time with Stephano, the neighbour's son, exploring the magical world of things past. Through their adventure into secret worlds, the pair makes exciting discoveries about ancient cultures and how they navigated their lives. Like Secrets of the Painted Door, the first in the series, this book pairs well with curriculum for Grades 5 and 6 in Ontario and BC, delving into ancient cultures, science and art in a way that is fun for young readers. 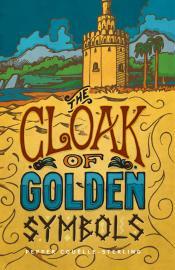 "Pepper Couelle-Sterling infuses the pages of The Cloak of Golden Symbols with her passion for art and art history. Her love of life in all its beautiful complexity breathes energy into Anna's latest quest. Here, learning is adventure. It is my hope that the brave and brilliant Anna, and her sidekick Stephano, will inspire a whole generation of art-lovers." "As an adult, I don’t usually read children’s books. But as a life-long professional writer and educator, I sometimes step out of my ordinary reading habits just to broaden my scope. Thus I read “Secrets of the Painted Door”, an intriguing blend of young adult magic-fantasy-adventure, with a healthy infusion of history, science, and culture, artfully interwoven to teach while entertaining. I’m sending my copy on to my granddaughter and next time I see her, we can journey together into ancient Athens, Egypt at the time of the Pharaohs, or Medieval Paris."